De Clerck C, Crew K, Van den Houwe I, McMichael L, Berhal C, Lassois L, M Jijakli H, Roux N, Thomas J, Massart S. 2017. Lessons learned from the virus indexing of Musa germplasm: insights from a multiyear collaboration. Annals of Applied Biology. 171:15–27. Elsen A, Baimey H, Swennen R, De Waele D. 2003. 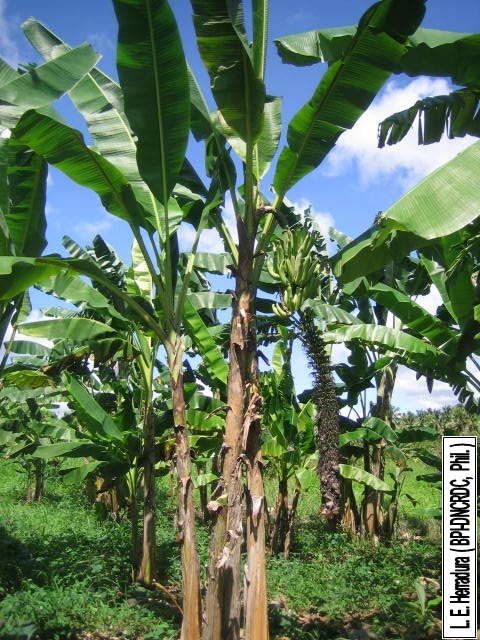 Relative mycorrhizal dependency and mycorrhiza-nematode interaction in banana cultivars (Musa spp.) differing in nematode susceptibility. Plant and soil. 256:303–313. Elsen A, Stoffelen R, Tuyet NThi, Baimey H, de Boulois HDupré, De Waele D. 2002. In vitro screening for resistance to Radopholus similis in Musa spp.. Plant Science. 163:407–416. Stoffelen R, Verlinden R, Pinochet J, Swennen R, de Waele D, . 2000. Screening of Fusarium wilt resistant bananas to root-lesion nematodes.. InfoMusa. 9:6–8. Stoffelen R, Verlinden R, Pinochet J, Swennen RL, De Waele D. 2000. Host plant response of Fusarium wilt resistant Musa genotypes to Radopholus similis and Pratylenchus coffeae. International Journal of Pest Management. 46:289–293. DOI (Digital Object Identifier) are used as Persistent Unique Identifiers (PUID) in the context of the Global Information System (GLIS) of Article 17 of the International Treaty on Plant Genetic Resources for Food and Agriculture (ITPGRFA). See MGIS DOI documentation for details.